What is the Faculty Council? The University of Groningen is governed by the Board of the University, which is responsible for the administration of the entire university. The University Council monitors the Board of the University and provides it with advice, both on request and on its own initiative. Staff members as well as students participate in this official representative body. The University of Groningen comprises ten faculties. Each faculty is governed by a Faculty Board, which is comparable to the Board of the University. Faculty Board meetings are also attended by a student; he or she is the Faculty Board’s student representative. The representative body at faculty level is the Faculty Council, which fulfils a role similar to that of the University Council. The BSS Faculty consists of three degree programmes, each of which is headed by a programme director, who is responsible for the daily routine. In addition, each programme has its own representative body: the degree programme advisory committee. A jaarvertegenwoordiging (‘Year Representation’) is a student representative body that represents a particular academic year within a degree programme. It consists of students only (as opposed to the other representative bodies),and while it is not an official representative body, it does play an important role in the participation process. A ‘Year Representation’ solves module-related problems, it evaluates all modules, and it discusses these evaluations with the lecturer(s) in question, the programme director, and the degree programme advisory committee. 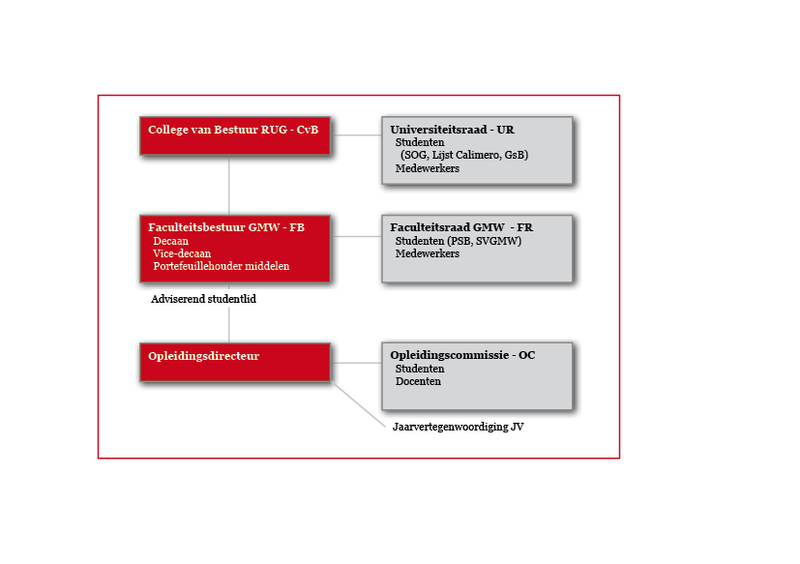 The diagram below gives an overview of the university bodies. Last modified: 26 February 2019 4.19 p.m.